"The Space Syntax approach is both an architectural theory and a software–based toolkit for the planning, design and management of the built environment. The approach investigates relationships between spatial layout and a range of social, economic and environmental phenomena including patterns of movement, public space use, land use and crime distribution. Space Syntax theory and technology was pioneered in the 1970s by Prof Bill Hillier and colleagues at University College London. Built on quantitative analysis and geospatial computer technology, the Space Syntax approach provides a set of evidence–based techniques for the analysis of spatial configurations of all kinds, especially where spatial configuration seems to be a significant aspect of human affairs, as it is in buildings and urban areas. 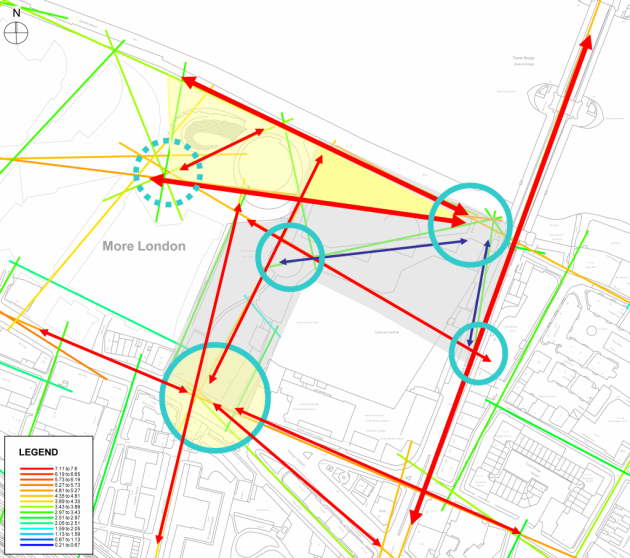 Applied in both academic research and practice, Space Syntax theory and technology treats cities and buildings 'space first', that is as the network of spaces that people use and move through."